*** WINNERS *** Holly and Nicole are Living the Life of Riley! CONGRATULATIONS! I want to give a big and hearty CONGRATULATIONS to Holly, the winner of the Sidewalk Surfers, Tube Flops or Sandals of CHOICE from Sanuk! Holly now has 48 hours to confirm! I also want to give a big and hearty CONGRATULATIONS to Nicole, the winner of the Boba Organic 2G Child Carrier from Nap, Inc.! Nicole now has 48 hours to confirm! 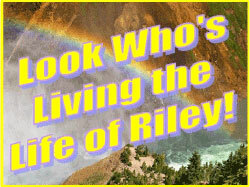 One Response to *** WINNERS *** Holly and Nicole are Living the Life of Riley! CONGRATULATIONS!